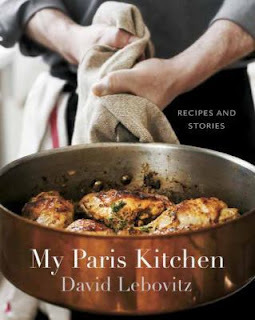 This month we shared the cookbook, My Paris Kitchen by David Lebovitz. And what a delight it was! The group was delighted to do a cookbook for a change of pace, and were super excited for our potluck. The book itself was so beautiful...nobody wanted to return it to the library. Everyone loved the way he wrote...like he was in the room with you talking. "He makes everything sound easy." Folks were surprised how hilariously funny the book could be at times. We all wanted to go to the market with him, and be his friend. Loved the discussion about his sink, too. There was so much passion in this book, about food, people, and bringing folks together. And such great stories! Our favorites were about the rotisserie chickens ("I vowed to eat less chicken skin and skip the workouts. So far I've been good at keeping the later promise to myself, but not the other.") and the story about the onion tarts. And the photographs...everything in this book made us drool. The only thing people didn't like about this book was that we couldn't make it all! (Ok, a few people found some of the beef photos unappealing, and some had trouble not splattering the library books, too). I've said this before, but this was one of our best meals EVER. 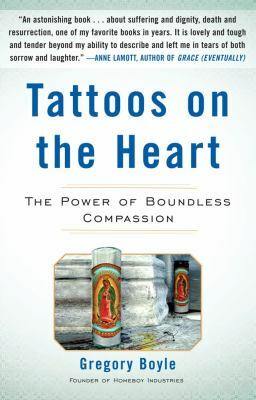 For March we are reading Tattoos on the Heart: the Power of Boundless Compassion by Father Gregory Boyle. (It is especially wonderful as an audiobook!) We will once again be meeting at Laura's house, and you are encouraged to bring some sort of Mexican food and/or baked goods!